For a long time I have been fascinated about breathing and the various styles of breathing. Maybe ‘style’ is not the correct word, but you get what I mean. I have been conducting experiments on myself and breathing in connection with sports performance and recovery. A lot of the older training and exercise manuals, as well as all of the meditation and spiritual traditions hinge on the breath, which cannot be a coincidence. Yet for some reason breathing has fallen out of fashion and in the modern books and video tutorials nobody talks about breathing and the importance and the effects of breathing well. Apart from a few ‘mavericks’ like Wim Hof. In a way focusing on the breath is so old that it has become new again. In another article I explained about the differences between shallow breathing, diaphragmatic and costal breathing, and briefly brushed on the differences between nasal and mouth breathing. In this article I will solely focus on nasal breathing and breath holding and how to make them deliver even more of an impact on your health and sports performance. Why - Paying attention to your breathing can make the difference in your competition performance as well as your recovery between races and training. It is a very simple variable that you can use to swing the odds in your favour. It is also completely free. You are already in possession of all the necessary kit. If you are in need of a bit more science on the topic, check out an awesome book called “Oxygen Advantage” by Patrick McKeown who has dedicated a lot of time and effort into researching it all. What - Nasal breathing gives a couple of distinct advantages over mouth breathing. Firstly you gain Nitric Oxide that helps dilate the smooth muscle in the walls of the bronchial tree, the lungs and even the heart and blood vessels, which is a huge benefit. The theory goes that it may even help you increase you maximal lung capacity and your VO2 max readings. It definitely enhances you functional lung capacity according to my experience. Secondly it helps reduce the workload on the shoulder muscles improving your breathing efficiency. This is especially important in endurance sport where energy expenditure must be kept at the barest minimum to ensure good form and good speed. Breath holding is essentially simulated altitude training. 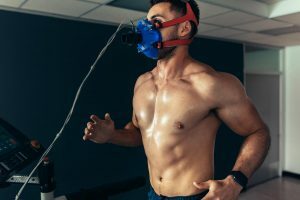 Where the altitude masks and things don’t actually work (apart from making it harder to breathe) breath holding will produce changes in your blood chemistry. Due to increased Carbon Dioxide concentration in the blood the oxygen that is carried in the haemoglobin becomes more available and you can access a far greater amount of the oxygen that you are carrying. The secondary benefit of practising breath holding is the up-regulation of EPO hormone, which increases the number of red blood cells in the blood and enables you to oxygenate your blood better. Traditionally people have been using either blood transfusions (messy and illegal) or altitude tents (cumbersome and expensive) in the absence of high altitude training camps (expensive). Now you can gain the same advantages freely wherever you are. How - Nasal breathing is easy. Just keep your mouth shut. At first you may feel like you are suffocating as your heart rate ramps up. Ease back a little until you feel comfortable again. Gradually you will be able to tolerate higher and higher training and racing intensities with nasal breathing only as your body makes the necessary adaptations. You will notice changes relatively quickly as you are better able to access your oxygen stores. You will feel better when training and be more in control. Since you are not getting as acidic as before your recovery takes place quicker and you will not feel the intense burning in the throat after high intensity efforts. You can even utilise nasal breathing in your sleep - simply put a strip of tape over your lips to stop you opening your mouth. I have found that my HRV score is always higher after taping my lips for the night than without. Breath holding should always tape place on empty lungs. As you breathe out simply delay taking another breath for a while. Once you need to breathe again continue nasal breathing. Fight the urge to gulp air through the mouth as that negates any benefit from the breath hold. The time is variable and related to your exercise intensity. At first it is a good idea to practice when walking and start by holding your breath and counting a few strides. Don’t hold it until you are blue in the face or there are stars swimming across your eyes, but just until you feel a moderate air hunger. Later on you can either lengthen the breath hold or start experimenting with it at higher intensities of exercise. Personally I always nasal breathe (apart from when talking or eating) and try and fill my runs and bike rides with lots of breath holding intervals. With swimming you can do hypoxic sets, meaning that you will only breathe ever 3, 5, 7, or 9 strokes, or even try and do entire lengths without coming up for a breath. Post training and racing and during recovery sessions, such as yoga, I tend to try and use a nasal and diaphragmatic breath to increase my endorphin production and to alkalise as best as I can. Take Home Message - Breath holding is not just marginal gains. It can transform your performance.